The OutDoor INDUSTRY AWARD 2014 winner Duffle RS with wheels combines the high standards with regards to travelling comfort with the extreme demands of an expedition bag. ORTLIEB developed a heavy duty wheel system adapted for tough conditions. The 90 mm wheels are connected to the bag in a watertight manner and render high clearance for off-road and outdoor use. 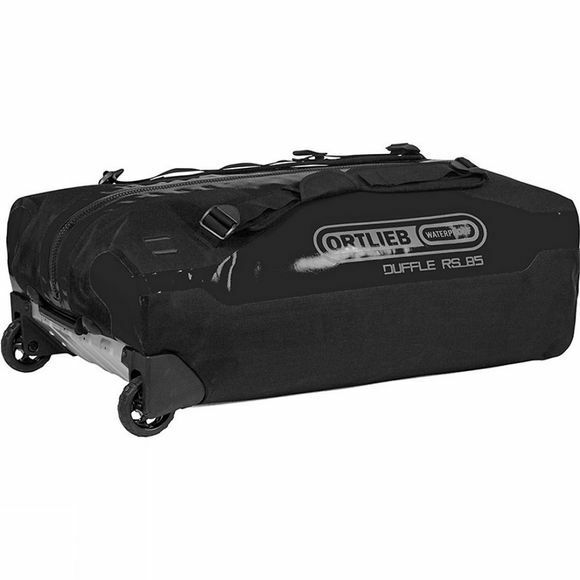 Instead of employing a telescopic system, Duffle RS features–for increased durability and low weight–an adjustable handle. Thanks to a foam-reinforced base the bag is extremely stable even when fully loaded. A long waterproof Tizip zipper protects your gear from rain and dirt while allowing quick access to its contents. For security, an integrated wire loop serves for locking and securing the bag with a padlock (lock not included). The perfect volume weight ratio of the Duffle RS makes this product the ideal choice for trips by plane. And when not in use, it can be nicely rolled up and stowed away.